O.K., now fess up. Who wrote something about a new car? How about a promotion? A bigger house? A raise? A yacht? But if you wrote down almost anything at all (except a wish for deeper and more long-lasting relationships), you’re probably wrong. 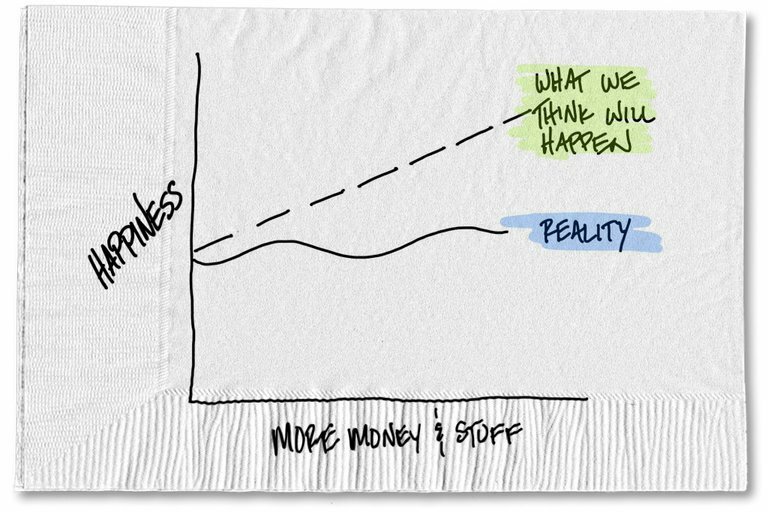 It turns out that happiness doesn’t come from more money, more stuff or even big life events like getting a raise or landing that dream job. A study from the 1970s by Philip Brickman, Dan Coates and Ronnie Janoff-Bulman for the Journal of Personality and Social Psychology even found that lottery winners took less satisfaction than nonlottery winners in everyday events, and in general, they were not any happier than those who didn’t win the lottery. If winning the lottery doesn’t bring happiness, how likely is it that a new boat will? It seems so shallow to think that some thing or number will make me happier. But then I realize how often I have heard others say it, too. Even more common is how often I see that underlying assumption play out in our behavior. We pass up life-changing experiences because we’re on track to become partner. We skip meaningful time with our families so we can respond to one more email. I assume this is all in pursuit of something out there that we think will make us happier. Unfortunately, this pursuit is futile. In fact, academics have a name for this cycle, which involves fixating on what we don’t have, actually getting that thing, not ending up any happier and then fixating on something else. They call it the hedonic treadmill. Despite all our efforts, we never get anywhere. We experience small ups and downs, but by and large, our happiness stays the same. Starting to feel exhausted? I know I am. I’ve been on the hedonic treadmill for over 20 years. I’m sick of putting happiness on some unattainable pedestal just around the corner, forever out of reach. This treadmill is so exhausting that just writing about it is making me tired. So I’m trying something different now. Instead of hopping on that thing each morning, hoping that day is the day it will make me measurably happier — and for me, that has meant skis, houses and plenty of other stuff — I’m moving. I’m leaving the country for a year and heading to New Zealand. I’ll still be writing and working, but I’ll also be leading my family on an incredible adventure, while trying to spend more meaningful time doing things that actually bring me (and them) happiness. Because you can’t really find it on a treadmill, and hopping off seems like our quickest route to being as happy as we possibly can be. Check back here to hear more about how it all goes. 0 responses on "Featured Blog: More Money, More Success, More Stuff? Don’t Count on More Happiness"